Synthetic peptide corresponding to Human CD20 (C terminal) conjugated to keyhole limpet haemocyanin. ab166865 is a PBS-only buffer formulated version of ab78237, containing no BSA or sodium azide, ideal for antibody labeling. Please refer to ab78237 for information on protocols, dilutions, and image data. Shipped at 4°C. Upon delivery aliquot. Store at -20°C. Our Abpromise guarantee covers the use of ab166865 in the following tested applications. Immunocytochemistry/ Immunofluorescence analysis of Ramos (human Burkitt's lymphoma B lymphocyte) labeling CD20 with purified ab78237 at 1/10 dilution. 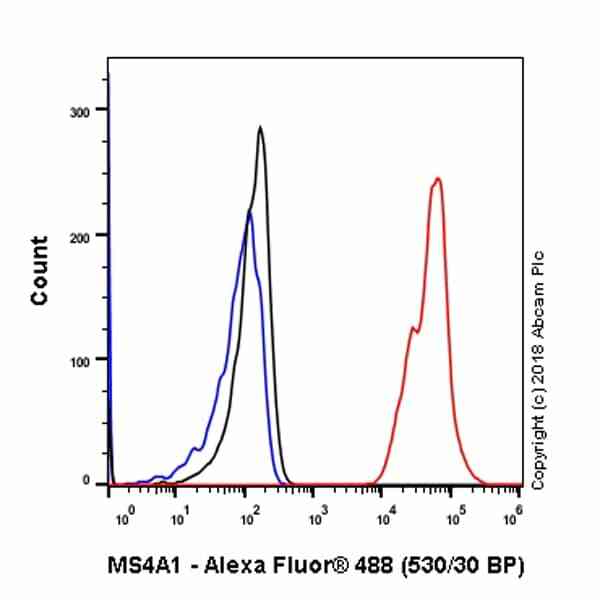 Goat anti rabbit IgG (Alexa Fluor® 488, ab150077) at 1/1000 was used as the secondary antibody. Cells were counterstained with ab195889, Anti-alpha Tubulin antibody [DM1A] - Microtubule Marker (Alexa Fluor® 594) at 1/200. PBS instead of the primary antibody was used as negative control. Cells were fixed with 4% paraformaldehyde and permeabilized with 0.1% Triton X-100. Nuclei were stained with DAPI (blue). This data was developed using the same antibody clone in a different buffer formulation containing PBS, BSA, glycerol, and sodium azide (ab78237). 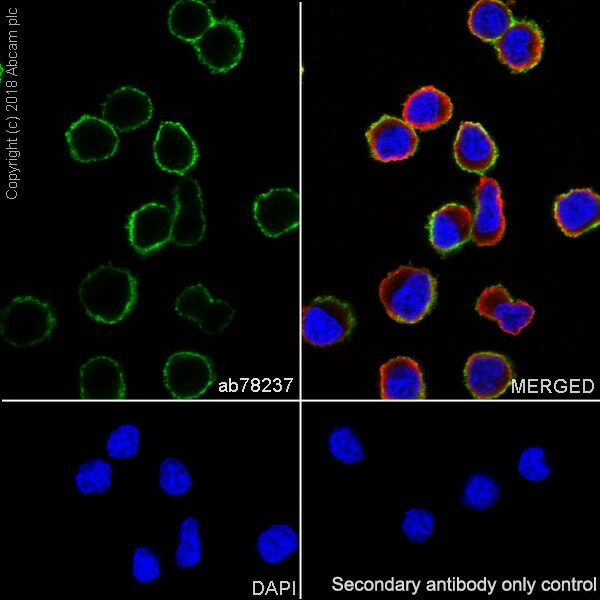 This IHC data was generated using the same anti-CD20 antibody clone, EP459Y, in a different buffer formulation (cat# ab78237). Immunohistochemical staining of paraffin embedded B cell lymphoma with purified ab78237 at a working dilution of 1/50. The secondary antibody used is ab97051, a goat anti-rabbit IgG (H&L) at a dilution of 1/500. The sample is counter-stained with hematoxylin. Antigen retrieval was perfomed using Tris-EDTA buffer, pH 9.0. PBS was used instead of the primary antibody as the negative control, and is shown in the inset. Unpurified ab78237 showing positive staining in normal spleen tissue. Unpurified ab78237 showing negative staining in normal brain tissue. Unpurified ab78237 showing negative staining in normal heart tissue. Unpurified ab78237 showing negative staining in normal kidney tissue. Unpurified ab78237 showing positive staining in normal tonsil tissue. ab166865 has not yet been referenced specifically in any publications. Publishing research using ab166865? Please let us know so that we can cite the reference in this datasheet. There are currently no Customer reviews or Questions for ab166865.